In this special place of red canyons, majestic mesas and amazing skies, Ghost Ranch hosts a number of groups and meetings, conferences and special workshops for various groups from around the world. 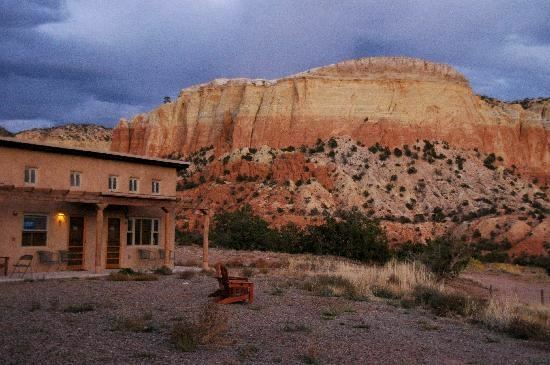 Ghost Ranch provides meeting opportunities for day retreats, as well as overnight lodging with meal plans for your multi-day Group Meetings & Gatherings. There are a variety of gathering and meeting spaces, indoor and outdoor, around and about Ghost Ranch. Lower Pavilion and Convocation Hall are the largest spaces and can hold the largest number of guests in a variety of configurations. The Agape Center has a large worship service area overlooking the Ghost Ranch fields with an inspiring view of the famous rock formation of Pedernal. The Arts Center and other meeting rooms are perfect for hands-on activities. Upper Pavilion, Long House, Cottonwood… there are many spaces unique to Ghost Ranch that will make your event successful and meaningful.